flags for gtx 650 ti? 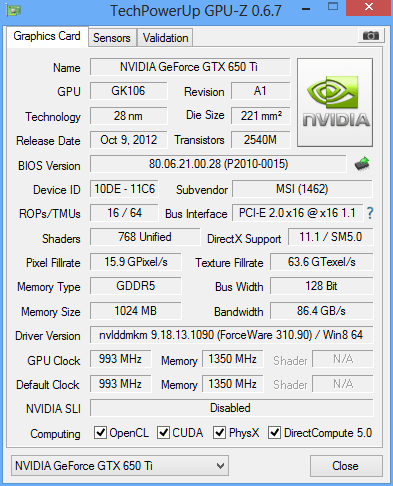 Bitcoin Forum > Other > Beginners & Help (Moderator: MiningBuddy) > flags for gtx 650 ti? Anyways, for this card on GUI miner, what should I use for flag's? Re: flags for gtx 650 ti? That site doesn't list the GTX 650 Ti. Also, avast detected CGMiner as a virus (specifically the file "scrypt121016.cl" and im very sure its not one, going through that file's source) so should I just make an exception for it? Cgminer is a false positive. That site DOES list the GTX 650 ti, learn how to read please. Based on same GK106 as 660ti which I believe is a neutered 670? It's not worth ruining your GPU. I recommend not mining on nVidia. Not only is it WAY slower and obviously less efficient than an AMD GPU, you will most likely decrease the lifespan of your card more than the few cents you would make from the mining. People can't be bothered to read, dontcha know? I bought it knowing it was a highly anticipated product. I expected some type of mass backup. But, I won't de-rail a thread, so I'll just leave it at here. Thanks again for answers.